Yiddish (ייִדיש, יידיש or אידיש, yidish/idish, lit. "Jewish", pronounced [ˈjɪdɪʃ] [ˈɪdɪʃ]; in older sources ייִדיש-טײַטש Yidish-Taitsh, lit. Judaeo-German) is the historical language of the Ashkenazi Jews. It originated during the 9th century in Central Europe, providing the nascent Ashkenazi community with a High German-based vernacular fused with elements taken from Hebrew and Aramaic as well as from Slavic languages and traces of Romance languages. Yiddish is written with a fully vocalized version of the Hebrew alphabet. The earliest surviving references date from the 12th century and call the language לשון־אַשכּנז‎ (loshn-ashknaz, "language of Ashkenaz") or טײַטש‎ (taytsh), a variant of tiutsch, the contemporary name for Middle High German. Colloquially, the language is sometimes called מאַמע־לשון‎ (mame-loshn, lit. "mother tongue"), distinguishing it from לשון־קודש‎ (loshn koydesh, "holy tongue"), meaning Hebrew and Aramaic. The term "Yiddish", short for Yidish Taitsh ("Jewish German"), did not become the most frequently used designation in the literature until the 18th century. In the late 19th and into the 20th century the language was more commonly called "Jewish", especially in non-Jewish contexts,[clarification needed] but "Yiddish" is again the more common designation today. Modern Yiddish has two major forms. Eastern Yiddish is far more common today. It includes Southeastern (Ukrainian–Romanian), Mideastern (Polish–Galician–Eastern Hungarian), and Northeastern (Lithuanian–Belarusian) dialects. Eastern Yiddish differs from Western both by its far greater size and by the extensive inclusion of words of Slavic origin. 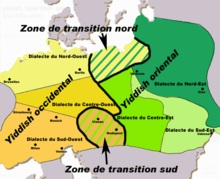 Western Yiddish is divided into Southwestern (Swiss–Alsatian–Southern German), Midwestern (Central German), and Northwestern (Netherlandic–Northern German) dialects. Yiddish is used in a number of Haredi Jewish communities worldwide; it is the first language of the home, school, and in many social settings among many Haredi Jews, and is used in most Hasidic and some Lithuanian yeshivas. The term "Yiddish" is also used in the adjectival sense, synonymously with "Jewish", to designate attributes of Yiddishkeit ("Ashkenazi culture"; for example, Yiddish cooking and "Yiddish music" - klezmer). Prior to the Holocaust, there were 11–13 million speakers of Yiddish among 17 million Jews worldwide. 85% of the approximately 6 million Jews who died in the Holocaust were Yiddish speakers, leading to a massive decline in the use of the language. 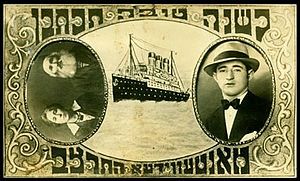 Assimilation following World War II and aliyah, immigration to Israel, further decreased the use of Yiddish both among survivors and among Yiddish-speakers from other countries (such as in the Americas). However, the number of speakers is increasing in Hasidic communities. The established view is that, as with other Jewish languages, Jews speaking distinct languages learned new co-territorial vernaculars, which they then Judaized. In the case of Yiddish, this scenario sees it as emerging when speakers of Zarphatic and other Judeo-Romance languages began to acquire varieties of Middle High German, and from these groups the Ashkenazi community took shape. Exactly what German base lies behind the earliest form of Yiddish is disputed. In Max Weinreich's model, Jewish speakers of Old French or Old Italian who were literate in either liturgical Hebrew or Aramaic, or both, migrated through Southern Europe to settle in the Rhine Valley in an area known as Lotharingia (later known in Yiddish as Loter) extending over parts of Germany and France; There, they encountered and were influenced by Jewish speakers of High German languages and several other German dialects. Both Weinreich and Solomon Birnbaum developed this model further in the mid-1950s. In Weinreich's view, this Old Yiddish substrate later bifurcated into two distinct versions of the language, Western and Eastern Yiddish. They retained the Semitic vocabulary and constructions needed for religious purposes and created a Judeo-German form of speech, sometimes not accepted as a fully autonomous language. Later linguistic research has finessed the Weinreich model or provided alternative approaches to the language's origins, with points of contention being the characterization of its Germanic base, the source of its Hebrew/Aramaic adstrata, and the means and location of this fusion. Some theorists argue that the fusion occurred with a Bavarian dialect base. The two main candidates for the germinal matrix of Yiddish, the Rhineland and Bavaria, are not necessarily incompatible. There may have been parallel developments in the two regions, seeding the Western and Eastern dialects of Modern Yiddish. Dovid Katz proposes that Yiddish emerged from contact between speakers of High German and Aramaic-speaking Jews from the Middle East. The lines of development proposed by the different theories do not necessarily rule out the others (at least not entirely); an article in The Forward argues that "in the end, a new 'standard theory' of Yiddish’s origins will probably be based on the work of Weinreich and his challengers alike." Paul Wexler proposed a model in 1991 that took Yiddish, by which he means primarily eastern Yiddish, not to be genetically grounded in a Germanic language at all, but rather as "Judeo-Sorbian" (a proposed West Slavic language) that had been relexified by High German. In more recent work, Wexler has argued that Eastern Yiddish is unrelated genetically to Western Yiddish. Wexler's model has met with little academic support, and strong critical challenges, especially among historical linguists. By the 10th century, a distinctive Jewish culture had formed in Central Europe which came to be called אַשכּנזי‎ Ashkenazi, "Ashkenazi Jews, from Hebrew: אַשכּנז‎ Ashkenaz (Genesis 10:3), the medieval Hebrew name for northern Europe and Germany. Ashkenaz was centered on the Rhineland (Mainz) and the Palatinate (notably Worms and Speyer), in what is now the westernmost part of Germany. Its geographic extent did not coincide with the German principalities of the time, and it included northern France. Ashkenaz bordered on the area inhabited by another distinctive Jewish cultural group, the Sephardi Jews, who ranged into southern France. Ashkenazi culture later spread into Eastern Europe with large-scale population migrations. Nothing is known with certainty about the vernacular of the earliest Jews in Germany, but several theories have been put forward. The first language of the Ashkenazim may, as noted above, have been the Aramaic language, the vernacular of the Jews in Roman-era Judea and ancient and early medieval Mesopotamia. The widespread use of Aramaic among the large non-Jewish Syrian trading population of the Roman provinces, including those in Europe, would have reinforced the use of Aramaic among Jews engaged in trade. In Roman times, many of the Jews living in Rome and Southern Italy appear to have been Greek-speakers, and this is reflected in some Ashkenazi personal names (e.g., Kalonymos and Yiddish Todres). Hebrew, on the other hand, was regarded as a holy language reserved for ritual and spiritual purposes and not for common use. It is generally accepted that early Yiddish was likely to have contained elements from other languages of the Near East and Europe, absorbed through migrations. Since some settlers may have come via France and Italy, it is also likely that the Romance-based Jewish languages of those regions were represented. Traces remain in the contemporary Yiddish vocabulary: for example, בענטשן‎ (bentshn, "to bless"), ultimately from the Latin benedicere; לייענען‎ (leyenen, "to read"), from the Old French lei(e)re; and the personal names בונים‎ Bunim (related to French bon nom, good name) and Yentl (Old French gentil, "noble"). Western Yiddish includes additional words of ultimate Latin derivation (but still very few): for example, אָרן‎ orn (to pray), cf. Old French "orer". The Jewish community in the Rhineland would have encountered the many dialects from which Standard German would emerge a few centuries later. In time, Jewish communities would have been speaking their own versions of these German dialects, mixed with linguistic elements that they themselves brought into the region. Although not reflected in the spoken language, a main point of difference was the use of the Hebrew alphabet for the recording of the Germanic vernacular, which may have been adopted either because of the community's familiarity with the alphabet or to prevent the non-Jewish population from understanding the correspondence. In addition, there was probably widespread illiteracy in the non-Hebrew script, with the level of illiteracy in the non-Jewish communities being even higher. Another point of difference was the use of Hebrew and Aramaic words. These words and terms were used because of their familiarity, but more so because in most cases there were no equivalent terms in the vernacular which could express the Jewish concepts or describe the objects of cultural significance. It is not known when Yiddish orthography first developed. The oldest surviving literary document using it is a blessing in the Worms machzor, a Hebrew prayer book from 1272. There is a scalable image online at the indicated reference. The Worms machzor is discussed in Frakes, 2004, and Baumgarten, ed. Frakes, 2005 – see the Bibliography at the foot of this article. May a good day come to him who carries this prayer book into the synagogue. This brief rhyme is decoratively embedded in an otherwise purely Hebrew text. Nonetheless, it indicates that the Yiddish of that day was a more or less regular Middle High German written in the Hebrew alphabet into which Hebrew words – מַחֲזוֹר, makhazor (prayerbook for the High Holy Days) and בֵּיתֿ הַכְּנֶסֶתֿ‎, "synagogue" (read in Yiddish as beis hakneses) – had been included. The niqqud appears as though it might have been added by a second scribe, in which case it may need to be dated separately and may not be indicative of the pronunciation of the rhyme at the time of its initial annotation. Over the course of the 14th and 15th centuries, songs and poems in Yiddish, and macaronic pieces in Hebrew and German, began to appear. These were collected in the late 15th century by Menahem ben Naphtali Oldendorf. During the same period, a tradition seems to have emerged of the Jewish community's adapting its own versions of German secular literature. The earliest Yiddish epic poem of this sort is the Dukus Horant, which survives in the famous Cambridge Codex T.-S.10.K.22. This 14th-century manuscript was discovered in the Cairo Geniza in 1896, and also contains a collection of narrative poems on themes from the Hebrew Bible and the Haggadah. The advent of the printing press in the 16th century enabled the large scale production of works, at a cheaper cost, some of which have survived. One particularly popular work was Elia Levita's Bovo-Bukh (בָּבָֿא-בּוך), composed around 1507–08 and printed several times, beginning in 1541 (Isny) (under the title: Bovo d'Antona). Levita, the earliest named Yiddish author, may also have written פּאַריז און װיענע‎ Pariz un Viene (Paris and Vienna). Another Yiddish retelling of a chivalric romance, װידװילט Vidvilt (often referred to as "Widuwilt" by Germanizing scholars), presumably also dates from the 15th century, although the manuscripts are from the 16th. It is also known as Kinig Artus Hof, an adaptation of the Middle High German romance Wigalois by Wirnt von Gravenberg. Another significant writer is Avroham ben Schemuel Pikartei, who published a paraphrase on the Book of Job in 1557. Women in the Ashkenazi community were traditionally not literate in Hebrew, but did read and write Yiddish. A body of literature therefore developed for which women were a primary audience. This included secular works, such as the Bovo-Bukh, and religious writing specifically for women, such as the צאנה וראינה‎ Tseno Ureno and the תחנות‎ Tkhines. One of the best-known early woman authors was Glückel of Hameln, whose memoirs are still in print. The segmentation of the Yiddish readership, between women who read מאַמע־לשון‎ mame-loshn but not לשון־קדש‎ loshn-koydesh, and men who read both, was significant enough that distinctive typefaces were used for each. 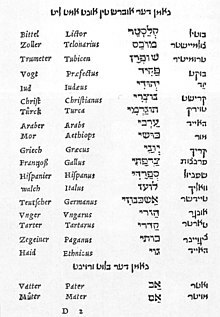 The name commonly given to the semicursive form used exclusively for Yiddish was ווײַבערטײַטש‎ (vaybertaytsh, 'women's taytsh', shown in the heading and fourth column in the adjacent illustration), with square Hebrew letters (shown in the third column) being reserved for text in that language and Aramaic. This distinction was retained in general typographic practice through to the early 19th century, with Yiddish books being set in vaybertaytsh (also termed מעשייט‎ mesheyt or מאַשקעט‎ mashket—the construction is uncertain). The Western Yiddish dialect—sometimes pejoratively labeled Mauscheldeutsch, i. e. "Moses German"—declined in the 18th century, as the Age of Enlightenment and the Haskalah led to a view of Yiddish as a corrupt dialect. A Maskil (one who take part in the Haskalah) would write about and promote acclimatization to the outside world. Jewish children began attending secular schools where the primary language spoken and taught was German, not Yiddish. Owing to both assimilation to German and the revival of Hebrew, Western Yiddish survived only as a language of "intimate family circles or of closely knit trade groups". (Liptzin 1972). In eastern Europe, the response to these forces took the opposite direction, with Yiddish becoming the cohesive force in a secular culture (see the Yiddishist movement). Notable Yiddish writers of the late 19th and early 20th centuries are Sholem Yankev Abramovitch, writing as Mendele Mocher Sforim; Sholem Rabinovitsh, widely known as Sholem Aleichem, whose stories about טבֿיה דער מילכיקער‎ (Tevye der milkhiker, "Tevye the Dairyman") inspired the Broadway musical and film Fiddler on the Roof; and Isaac Leib Peretz. 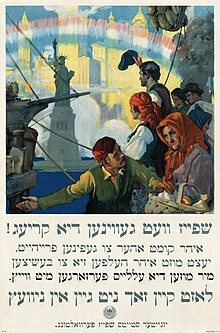 American World War I-era poster in Yiddish. Translated caption: "Food will win the war – You came here seeking freedom, now you must help to preserve it – We must supply the Allies with wheat – Let nothing go to waste". Colour lithograph, 1917. Digitally restored. 1917. 100 karbovanets of the Ukrainian National Republic. Revers. 3 languages: Ukrainian, Polish and Yiddish. In the early 20th century, especially after the Socialist October Revolution in Russia, Yiddish was emerging as a major Eastern European language. Its rich literature was more widely published than ever, Yiddish theatre and Yiddish cinema were booming, and it for a time achieved status as one of the official languages of the Ukrainian People's Republic, the Byelorussian Soviet Socialist Republic and the short-lived Galician Soviet Socialist Republic, and the Jewish Autonomous Oblast. Educational autonomy for Jews in several countries (notably Poland) after World War I led to an increase in formal Yiddish-language education, more uniform orthography, and to the 1925 founding of the Yiddish Scientific Institute, YIVO. In Vilnius, there was debate over which language should take primacy, Hebrew or Yiddish. Yiddish changed significantly during the 20th century. Michael Wex writes, "As increasing numbers of Yiddish speakers moved from the Slavic-speaking East to Western Europe and the Americas in the late 19th and early 20th centuries, they were so quick to jettison Slavic vocabulary that the most prominent Yiddish writers of the time—the founders of modern Yiddish literature, who were still living in Slavic-speaking countries—revised the printed editions of their oeuvres to eliminate obsolete and 'unnecessary' Slavisms." The vocabulary used in Israel absorbed many Modern Hebrew words, and there was a similar but smaller increase in the English component of Yiddish in the United States and, to a lesser extent, the United Kingdom. This has resulted in some difficulty in communication between Yiddish speakers from Israel and those from other countries. Yiddish phonology is similar to that of Standard German. However, it does not have final-obstruent devoicing and fortis (voiceless) stop consonants are unaspirated, and the /χ/ phoneme is invariably uvular, unlike the German phoneme /x/, which is palatal, velar, or uvular. Yiddish has a smaller inventory of vowels than Standard German, lacking vowel length distinction and the umlauted vowels ö and ü.
Map of the Yiddish dialects between the 15th and the 19th centuries (Western dialects in orange / Eastern dialects in green). On the eve of World War II, there were 11 to 13 million Yiddish speakers. The Holocaust, however, led to a dramatic, sudden decline in the use of Yiddish, as the extensive Jewish communities, both secular and religious, that used Yiddish in their day-to-day life, were largely destroyed. Around five million of those killed — 85 percent of the Jews who died in the Holocaust — were speakers of Yiddish. 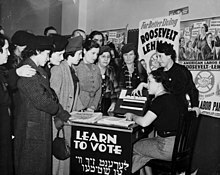 Although millions of Yiddish speakers survived the war (including nearly all Yiddish speakers in the Americas), further assimilation in countries such as the United States and the Soviet Union, along with the strictly monolingual stance of the Zionist movement, led to a decline in the use of Eastern Yiddish. However, the number of speakers within the widely dispersed Haredi (mainly Hasidic) communities is now increasing. Although used in various countries, Yiddish has attained official recognition as a minority language only in Moldova, Bosnia and Herzegovina, the Netherlands, and Sweden. Reports of the number of current Yiddish speakers vary significantly. Ethnologue estimates, based on publications through 1991, that there were at that time 1.5 million speakers of Eastern Yiddish, of which 40% lived in Ukraine, 15% in Israel, and 10% in the United States. The Modern Language Association agrees with fewer than 200,000 in the United States. Western Yiddish is reported by Ethnologue to have had an ethnic population of 50,000 in 2000, and an undated speaking population of 5,000, mostly in Germany. A 1996 report by the Council of Europe estimates a worldwide Yiddish-speaking population of about two million. Further demographic information about the recent status of what is treated as an Eastern–Western dialect continuum is provided in the YIVO Language and Cultural Atlas of Ashkenazic Jewry (Language and Cultural Atlas of Ashkenazic Jewry). In certain areas of New York it is more common to see boys talking amongst themselves in Yiddish, whereas girls tend to favor English as their main language. This is probably due to more Hasidic boy schools using Yiddish as the medium of instruction, while many Hasidic girl schools opt to teach in English. Also, girls tend to learn more secular subjects, thus increasing contact with the English language, and boys are usually taught religious subjects in Yiddish, and thus use the Yiddish language more often, which allows them to be more comfortable speaking the language. The same occurs in Israel, where boys tend to speak more Yiddish amongst themselves, while girls tend to use Hebrew more often. There has been frequent debate about the extent of the linguistic independence of Yiddish from the languages that it absorbed. There has been periodic assertion that Yiddish is a dialect of German, or even "just broken German, more of a linguistic mishmash than a true language". Even when recognized as an autonomous language, it has sometimes been referred to as Judeo-German, along the lines of other Jewish languages like Judeo-Persian, Judaeo-Spanish or Zarphatic. A widely cited summary of attitudes in the 1930s was published by Max Weinreich, quoting a remark by an auditor of one of his lectures: אַ שפּראַך איז אַ דיאַלעקט מיט אַן אַרמיי און פֿלאָט‎ (a shprakh iz a dialekt mit an armey un flot — "A language is a dialect with an army and navy"). An example of graffiti in Yiddish, Tel Aviv, Washington Avenue (און איר זאלט ליב האבן דעם פרעמדען, ווארום פרעמדע זייט איר געווען אין לאנד מצרים Un ir zolt lib hobn dem fremdn varum fremde seit ir geven in land mitsrayim). "Ye shall have love for the stranger, because ye were strangers in the land of Egypt (Deuteronomy 10:19)"
The national language of Israel is Hebrew. The debate in Zionist circles over the use of Yiddish in Israel and in the Diaspora in preference to Hebrew also reflected the tensions between religious and secular Jewish lifestyles. Many secular Zionists wanted Hebrew as the sole language of Jews, to contribute to a national cohesive identity. Traditionally religious Jews, on the other hand, preferred use of Yiddish, viewing Hebrew as a respected holy language reserved for prayer and religious study. In the early 20th century, Zionist activists in Palestine tried to eradicate the use of Yiddish among Jews in preference to Hebrew, and make its use socially unacceptable. This conflict also reflected the opposing views among secular Jews worldwide, one side seeing Hebrew (and Zionism) and the other Yiddish (and Internationalism) as the means of defining Jewish nationalism. In the 1920s and 1930s, גדוד מגיני השפה gdud maginéi hasafá, "the language defendants regiment", whose motto was "עברי, דבר עברית ivri, dabér ivrít", that is, "Hebrew [i.e. Jew], speak Hebrew! ", used to tear down signs written in "foreign" languages and disturb Yiddish theatre gatherings. However, according to linguist Ghil'ad Zuckermann, the members of this group in particular, and the Hebrew revival in general, did not succeed in uprooting Yiddish patterns (as well as the patterns of other European languages Jewish immigrants spoke) within what he calls "Israeli", i.e. Modern Hebrew. Zuckermann believes that "Israeli does include numerous Hebrew elements resulting from a conscious revival but also numerous pervasive linguistic features deriving from a subconscious survival of the revivalists’ mother tongues, e.g. Yiddish." After the founding of the State of Israel, a massive wave of Jewish immigrants from Arab countries arrived. In short order, these Mizrahi Jews and their descendants would account for nearly half the Jewish population. While all were at least familiar with Hebrew as a liturgical language, essentially none had any contact with or affinity for Yiddish (some, of Sephardic origin, spoke Judaeo-Spanish, others various Judeo-Arabic languages). Thus, Hebrew emerged as the dominant linguistic common denominator between the different population groups. In religious circles, it is the Ashkenazi Haredi Jews, particularly the Hasidic Jews and the Lithuanian yeshiva world (see Lithuanian Jews), who continue to teach, speak and use Yiddish, making it a language used regularly by hundreds of thousands of Haredi Jews today. The largest of these centers are in Bnei Brak and Jerusalem. There is a growing revival of interest in Yiddish culture among secular Israelis, with the flourishing of new proactive cultural organizations like YUNG YiDiSH, as well as Yiddish theatre (usually with simultaneous translation to Hebrew and Russian) and young people are taking university courses in Yiddish, some achieving considerable fluency. In the Soviet Union during the 1920s, Yiddish was promoted as the language of the Jewish proletariat. State emblem of the Byelorussian Soviet Socialist Republic with the motto Workers of the world, unite! in Yiddish (lower left part of the ribbon): ״פראָלעטאריער פון אלע לענדער, פאראייניקט זיך!״, Proletarier fun alle lender, fareynikt sich! The same slogan is written in Belarusian, Russian and Polish. It was one of the official languages of the Byelorussian Soviet Socialist Republic. Until 1938, the Emblem of the Byelorussian Soviet Socialist Republic included the motto Workers of the world, unite! in Yiddish. Yiddish was also official language in several agricultural districts of the Galician Soviet Socialist Republic. A public educational system entirely based on the Yiddish language was established and comprised kindergartens, schools, and higher educational institutions (technical schools, rabfaks and other university departments). At the same time, Hebrew was considered a bourgeois language and its use was generally discouraged. The vast majority of the Yiddish-language cultural institutions were closed in the late 1930s, along with cultural institutions of other ethnic minorities lacking administrative entities of their own. The last Yiddish-language schools, theaters and publications were closed by the end of the 1940s. It continued to be spoken widely for decades, nonetheless, in areas with compact Jewish populations (primarily in Moldova, Ukraine, and to a lesser extent Belarus). In the former Soviet states, recently active Yiddish authors include Yoysef Burg (Chernivtsi 1912–2009) and Olexander Beyderman (b. 1949, Odessa). Publication of an earlier Yiddish periodical (דער פֿרײַנד‎ - der fraynd; lit. "The Friend"), was resumed in 2004 with דער נײַער פֿרײַנד‎ (der nayer fraynd; lit. "The New Friend", Saint Petersburg). According to the 2010 census, 1,683 people spoke Yiddish in Russia, approximately 1% of all the Jews of the Russian Federation. According to Mikhail Shvydkoy, former Minister of Culture of Russia and himself of Jewish origin, Yiddish culture in Russia is gone, and its revival is unlikely. From my point of view, Yiddish culture today isn't just fading away, but disappearing. It is stored as memories, as fragments of phrases, as books that have long gone unread. ... Yiddish culture is dying and this should be treated with utmost calm. There is no need to pity that which cannot be resurrected — it has receded into the world of the enchanting past, where it should remain. Any artificial culture, a culture without replenishment, is meaningless. ... Everything that happens with Yiddish culture is transformed into a kind of cabaret—epistolary genre, nice, cute to the ear and the eye, but having nothing to do with high art, because there is no natural, national soil. In Russia, it is the memory of the departed, sometimes sweet memories. But it's the memories of what will never be again. Perhaps that's why these memories are always so sharp. The Jewish Autonomous Oblast was formed in 1934 in the Russian Far East, with its capital city in Birobidzhan and Yiddish as its official language. The intention was for the Soviet Jewish population to settle there. Jewish cultural life was revived in Birobidzhan much earlier than elsewhere in the Soviet Union. Yiddish theaters began opening in the 1970s. The newspaper דער ביראָבידזשאַנער שטערן‎ (Der Birobidzhaner Shtern; lit: "The Birobidzhan Star") includes a Yiddish section. Although the official status of the language was not retained by the Russian Federation, its cultural significance is still recognized and bolstered. The First Birobidzhan International Summer Program for Yiddish Language and Culture was launched in 2007. As of 2010[update], according to data provided by the Russian Census Bureau, there were 97 speakers of Yiddish in the JAO. A November 2017 article in The Guardian, titled, "Revival of a Soviet Zion: Birobidzhan celebrates its Jewish heritage", examined the current status of the city and suggested that, even though the Jewish Autonomous Region in Russia’s far east is now barely 1% Jewish, officials hope to woo back people who left after Soviet collapse and to revive the Yiddish language in this region. Yiddish was an official language of the Ukrainian People's Republic (1917–1921). Several countries that ratified the 1992 European Charter for Regional or Minority Languages have included Yiddish in the list of their recognized minority languages: the Netherlands (1996), Sweden (2000), Romania (2008), Poland (2009), Bosnia and Herzegovina (2010). In 2005, Ukraine did not mention Yiddish as such, but "the language(s) of the Jewish ethnic minority". In June 1999, the Swedish Parliament enacted legislation giving Yiddish legal status as one of the country's official minority languages (entering into effect in April 2000). The rights thereby conferred are not detailed, but additional legislation was enacted in June 2006 establishing a new governmental agency, The Swedish National Language Council, the mandate of which instructs it to "collect, preserve, scientifically research, and spread material about the national minority languages", naming them all explicitly, including Yiddish. When announcing this action, the government made an additional statement about "simultaneously commencing completely new initiatives for... Yiddish [and the other minority languages]". The Swedish government publishes documents in Yiddish, of which the most recent details the national action plan for human rights. An earlier one provides general information about national minority language policies. On 6 September 2007, it became possible to register Internet domains with Yiddish names in the national top-level domain .SE. The first Jews were permitted to reside in Sweden during the late 18th century. The Jewish population in Sweden is estimated at around 20,000. Of these, according to various reports and surveys, between 2,000 and 6,000 claim to have at least some knowledge of Yiddish. In 2009, the number of native speakers among these was estimated by linguist Mikael Parkvall to be 750–1,500. It is believed that virtually all native speakers of Yiddish in Sweden today are adults, and most of them elderly. Yiddish distribution in the United States. In the United States, at first most Jews were of Sephardic origin, and hence did not speak Yiddish. It was not until the mid-to-late 19th century, as first German, then Eastern European, Jews arrived in the nation, that Yiddish became dominant within the immigrant community. This helped to bond Jews from many countries. פֿאָרווערטס‎ (Forverts – The Forward) was one of seven Yiddish daily newspapers in New York City, and other Yiddish newspapers served as a forum for Jews of all European backgrounds. In 1915, the circulation of the daily Yiddish newspapers was half a million in New York City alone, and 600,000 nationally. In addition, thousands more subscribed to the numerous weekly papers and the many magazines. The typical circulation in the 21st century is a few thousand. The Forward still appears weekly and is also available in an online edition. It remains in wide distribution, together with דער אַלגעמיינער זשורנאַל‎ (der algemeyner zhurnal – Algemeiner Journal; algemeyner = general), a Chabad newspaper which is also published weekly and appears online. The widest-circulation Yiddish newspapers are probably the weekly issues Der Yid (דער איד‎ "The Jew"), Der Blatt (דער בלאַט‎; blat "paper") and Di Tzeitung (די צייטונג‎ "the newspaper"). Several additional newspapers and magazines are in regular production, such as the weekly אידישער טריביון Yiddish Tribune and the monthly publications דער שטערן‎ (Der Shtern "The Star") and דער בליק‎ (Der Blik "The View"). (The romanized titles cited in this paragraph are in the form given on the masthead of each publication and may be at some variance both with the literal Yiddish title and the transliteration rules otherwise applied in this article.) Thriving Yiddish theater, especially in the New York City Yiddish Theatre District, kept the language vital. Interest in klezmer music provided another bonding mechanism. Most of the Jewish immigrants to the New York metropolitan area during the years of Ellis Island considered Yiddish their native language; however, native Yiddish speakers tended not to pass the language on to their children, who assimilated and spoke English. For example, Isaac Asimov states in his autobiography In Memory Yet Green that Yiddish was his first and sole spoken language, and remained so for about two years after he emigrated to the United States as a small child. By contrast, Asimov's younger siblings, born in the United States, never developed any degree of fluency in Yiddish. Many "Yiddishisms", like "Italianisms" and "Spanishisms", entered New York City English, often used by Jews and non-Jews alike, unaware of the linguistic origin of the phrases. Yiddish words used in English were documented extensively by Leo Rosten in The Joys of Yiddish; see also the list of English words of Yiddish origin. In 1975, the film Hester Street, much of which is in Yiddish, was released. It was later chosen to be on the Library of Congress National Film Registry for being considered a "culturally, historically, or aesthetically significant" film. In 1976, the Canadian-born American author Saul Bellow received the Nobel Prize in Literature. He was fluent in Yiddish, and translated several Yiddish poems and stories into English, including Isaac Bashevis Singer's "Gimpel the Fool". In 1978, Singer, a writer in the Yiddish language, who was born in Poland and lived in the United States, received the Nobel Prize in Literature. Legal scholars Eugene Volokh and Alex Kozinski argue that Yiddish is "supplanting Latin as the spice in American legal argot". In the 2000 United States Census, 178,945 people in the United States reported speaking Yiddish at home. Of these speakers, 113,515 lived in New York (63.43% of American Yiddish speakers); 18,220 in Florida (10.18%); 9,145 in New Jersey (5.11%); and 8,950 in California (5.00%). The remaining states with speaker populations larger than 1,000 are Pennsylvania (5,445), Ohio (1,925), Michigan (1,945), Massachusetts (2,380), Maryland (2,125), Illinois (3,510), Connecticut (1,710), and Arizona (1,055). The population is largely elderly: 72,885 of the speakers were older than 65, 66,815 were between 18 and 64, and only 39,245 were age 17 or lower. In the six years since the 2000 census, the 2006 American Community Survey reflected an estimated 15 percent decline of people speaking Yiddish at home in the U.S. to 152,515. In 2011, the number of persons in the United States above the age of 5 speaking Yiddish at home was 160,968. There are a few predominantly Hasidic communities in the United States in which Yiddish remains the majority language including concentrations in the Crown Heights, Borough Park, and Williamsburg neighborhoods of Brooklyn. In Kiryas Joel in Orange County, New York, in the 2000 census, nearly 90% of residents of Kiryas Joel reported speaking Yiddish at home. There are well over 30,000 Yiddish speakers in the United Kingdom, and several thousand children now have Yiddish as a first language. The largest group of Yiddish speakers in Britain reside in the Stamford Hill district of North London, but there are sizable communities in northwest London, Leeds, Manchester and Gateshead. The Yiddish readership in the UK is mainly reliant upon imported material from the United States and Israel for newspapers, magazines and other periodicals. However, the London-based weekly Jewish Tribune has a small section in Yiddish called אידישע טריבונע‎ Yidishe Tribune. From the 1910s to the 1950s, London had a daily Yiddish newspaper called די צײַט (Di Tsayt, Yiddish pronunciation: [dɪ tsaɪt]; in English, The Time), founded, and edited from offices in Whitechapel Road, by Romanian-born Morris Myer, who was succeeded on his death in 1943 by his son Harry. There were also from time to time Yiddish newspapers in Manchester, Liverpool, Glasgow and Leeds. Montreal had, and to some extent still has, one of the most thriving Yiddish communities in North America. Yiddish was Montreal's third language (after French and English) for the entire first half of the twentieth century. Der Keneder Adler ("The Canadian Eagle", founded by Hirsch Wolofsky), Montreal’s daily Yiddish newspaper, appeared from 1907 to 1988. The Monument-National was the center of Yiddish theater from 1896 until the construction of the Saidye Bronfman Centre for the Arts (now the Segal Centre for Performing Arts), inaugurated on September 24, 1967, where the established resident theater, the Dora Wasserman Yiddish Theatre, remains the only permanent Yiddish theatre in North America. The theatre group also tours Canada, US, Israel, and Europe. Even though Yiddish has receded, it is the immediate ancestral language of Montrealers like Mordecai Richler, Leonard Cohen as well as former interim city mayor Michael Applebaum. Besides Yiddish-speaking activists, it remains today the native everyday language of 15,000 Montreal Hasidim. The major exception to the decline of spoken Yiddish can be found in Haredi communities all over the world. In some of the more closely knit such communities, Yiddish is spoken as a home and schooling language, especially in Hasidic, Litvish, or Yeshivish communities, such as Brooklyn's Borough Park, Williamsburg, and Crown Heights, and in the communities of Monsey, Kiryas Joel, and New Square in New York (over 88% of the population of Kiryas Joel is reported to speak Yiddish at home.) Also in New Jersey, Yiddish is widely spoken mostly in Lakewood Township, but also in smaller towns with yeshivas, such as Passaic, Teaneck, and elsewhere. Yiddish is also widely spoken in the Jewish community in Antwerp, and in Haredi communities such as the ones in London, Manchester, and Montreal. Yiddish is also spoken in many Haredi communities throughout Israel. Among most Ashkenazi Haredim, Hebrew is generally reserved for prayer, while Yiddish is used for religious studies, as well as a home and business language. In Israel, however, Haredim commonly speak Hebrew, with the notable exception of many Hasidic communities. However, many Haredim who use Modern Hebrew also understand Yiddish. There are some who send their children to schools in which the primary language of instruction is Yiddish. Members of anti-Zionist Haredi groups such as the Satmar Hasidim, who view the commonplace use of Hebrew as a form of Zionism, use Yiddish almost exclusively. Hundreds of thousands of young children around the globe have been, and are still, taught to translate the texts of the Torah into Yiddish. This process is called טײַטשן‎ (taytshn) – "translating". Most Ashkenazi yeshivas' highest level lectures in Talmud and Halakha are delivered in Yiddish by the rosh yeshivas as well as ethical talks of the Musar movement. Hasidic rebbes generally use only Yiddish to converse with their followers and to deliver their various Torah talks, classes, and lectures. The linguistic style and vocabulary of Yiddish have influenced the manner in which many Orthodox Jews who attend yeshivas speak English. This usage is distinctive enough that it has been dubbed "Yeshivish". While Hebrew remains the exclusive language of Jewish prayer, the Hasidim have mixed some Yiddish into their Hebrew, and are also responsible for a significant secondary religious literature written in Yiddish. For example, the tales about the Baal Shem Tov were written largely in Yiddish. The Torah Talks of the late Chabad leaders are published in their original form, Yiddish. In addition, some prayers, such as "God of Abraham", were composed and are recited in Yiddish. A road sign in Yiddish (except for the word "sidewalk") at an official construction site in the Monsey hamlet, a community with thousands of Yiddish speakers, in Ramapo, New York. There has been a resurgence in Yiddish learning in recent times among many from around the world with Jewish ancestry. The language which had lost many of its native speakers during WWII has been making something of a comeback. In Poland, which traditionally had Yiddish speaking communities, a museum has begun to revive Yiddish education and culture. Located in Kraków, the Galicia Jewish Museum offers classes in Yiddish Language Instruction and workshops on Yiddish Songs. The museum has taken steps to revive the culture through concerts and events held on site. There are various Universities worldwide which now offer Yiddish programs based on the YIVO Yiddish standard. Many of these programs are held during the summer and are attended by Yiddish enthusiasts from around the world. One such school located within Vilnius University (Vilnius Yiddish Institute) was the first Yiddish center of higher learning to be established in post-Holocaust Eastern Europe. Vilnius Yiddish Institute is an integral part of the four-century-old Vilnius University. Published Yiddish scholar and researcher Dovid Katz is among the Faculty. Despite this growing popularity among many American Jews, finding opportunities for practical use of Yiddish is becoming increasingly difficult, and thus many students have trouble learning to speak the language. One solution has been the establishment of a farm in Goshen, New York for Yiddishists. Yiddish is the medium of instruction in many Hasidic חדרים khadoorim, Jewish boy schools, and some Hasidic girl schools. Google Translate includes Yiddish as one of its languages, as does Wikipedia. Hebrew alphabet keyboards are available and right-to-left writing recognised. Google search accepts queries in Yiddish. Over ten thousand Yiddish texts, estimated as over half of all the published works in Yiddish, are now online based on the work of the Yiddish Book Center, volunteers, and the Internet Archive. There are many websites on the Internet in Yiddish. In January 2013, The Forward announced the launch of the new daily version of their newspaper's website, which has been active since 1999 as an online weekly, supplied with radio and video programs, a literary section for fiction writers and a special blog written in local contemporary Hasidic dialects. Computer scientist Raphael Finkel maintains a hub of Yiddish-language resources, including a searchable dictionary and spell checker. In late 2016, Motorola, Inc. released its smartphones with keyboard access for the Yiddish language in its foreign language option. As this article has explained, Yiddish has influenced Modern Hebrew and New York English, especially as spoken by yeshivah students (sometimes known as Yeshivish). Paul Wexler proposed that Esperanto was not an arbitrary pastiche of major European languages but a Latinate relexification of Yiddish, a native language of its founder. This model is generally unsupported by mainstream linguists. 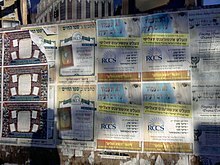 A 2008 Election poster in front of a store in Village of New Square, Town of Ramapo, New York, entirely in Yiddish. The candidates' names are transliterated into Yiddish. Rosh Hashanah greeting card, Montevideo, 1932. Inscription includes text in Hebrew (לשנה טובה תכתבו—LeShaná Tová Tikatevu) and Yiddish (מאנטעווידעא—Montevideo). Here is a short example of the Yiddish language with standard German as a comparison. Yiddish dialects—as spoken in different regions of Europe. Yiddish grammar—the structural detail of the language. Yiddish orthography—the written representation of the language. Yiddish words used in English—definitions of Yiddish words used in a primarily English context. ^ Hammarström, Harald; Forkel, Robert; Haspelmath, Martin, eds. (2017). "Yiddish". Glottolog 3.0. Jena, Germany: Max Planck Institute for the Science of Human History. ^ Matras, Yaron. "Archive of Endangered and Smaller Languages: Yiddish". University of Manchester. humanities.manchester.ac.uk. Matres explains that with the emigration of Jews eastward into Slavic-speaking areas of Central Europe, from around the twelfth century onward, Yiddish "took on an independent development path", adding: "It was only in this context that Jews began to refer to their language as 'Yiddish' (= 'Jewish'), while earlier it had been referred to as 'Yiddish-Taitsh' (='Judeo-German')." ^ Jacobs, Neil G. (2005). Yiddish: a Linguistic Introduction. Cambridge University Press. p. 2. ISBN 0-521-77215-X. ^ Baumgarten, Jean; Frakes, Jerold C. (1 June 2005). Introduction to Old Yiddish literature. Oxford University Press. p. 72. ^ "Development of Yiddish over the ages". jewishgen.org. ^ Aram Yardumian, "A Tale of Two Hypotheses: Genetics and the Ethnogenesis of Ashkenazi Jewry". University of Pennsylvania. 2013. ^ Oscar Levant described Cole Porter's 'My Heart Belongs to Daddy" as "one of the most Yiddish tunes ever written" despite the fact that "Cole Porter's genetic background was completely alien to any Jewishness." Oscar Levant,The Unimportance of Being Oscar, Pocket Books 1969 (reprint of G.P. Putnam 1968), p. 32. ISBN 0-671-77104-3. ^ a b c Dovid Katz. "YIDDISH" (PDF). YIVO. Archived from the original (PDF) on March 22, 2012. Retrieved 20 December 2015. ^ a b Solomon Birnbaum, Grammatik der jiddischen Sprache (4., erg. Aufl., Hamburg: Buske, 1984), p. 3. ^ Yiddish (2005). Keith Brown (ed.). Encyclopedia of Language and Linguistics (2 ed.). Elsevier. ISBN 0-08-044299-4. ^ a b c d Spolsky, Bernard (2014). The Languages of the Jews: A Sociolinguistic History. Cambridge University Press. p. 183. ISBN 978-1-139-91714-8. ^ Max Weinreich, History of the Yiddish Language, ed. Paul Glasser, Yale University Press/ YIVO Institute for Jewish Research, 2008 p.336. ^ Weinreich, Uriel, ed. (1954). The Field of Yiddish. Linguistic Circle of New York. pp. 63–101. ^ a b c Aptroot, Marion; Hansen, Björn (2014). Yiddish Language Structures. De Gruyter Mouton. p. 108. ISBN 978-3-11-033952-9. ^ Jacobs, Neil G. (2005). Yiddish: a Linguistic Introduction. Cambridge University Press. pp. 9–15. ISBN 0-521-77215-X. ^ Philologos (July 27, 2014). "The Origins of Yiddish: Part Fir". The Forward. ^ Kriwaczek, Paul (2005). Yiddish Civilization: The Rise and Fall of a Forgotten Nation. London: Weidenfeld & Nicolson. ISBN 0-297-82941-6., Chapter 3, footnote 9. ^ Beider, Alexander (2015). Origins of Yiddish Dialects. ISBN 978-0-19-873931-9, pp. 382-402. ^ "Image". Yivoencyclopedia.org. Retrieved 2010-08-07. ^ "בדעתו". Milon.co.il. 2007-05-14. Retrieved 2010-08-07. ^ Old Yiddish Literature from Its Origins to the Haskalah Period by Zinberg, Israel. KTAV, 1975. ISBN 0-87068-465-5. ^ Max Weinreich, געשיכטע פֿון דער ייִדישער שפּראַך (New York: YIVO, 1973), vol. 1, p. 280, with explanation of symbol on p. xiv. ^ Bechtel, Delphine (2010). "Yiddish Theatre and Its Impact on the German and Austrian Stage". In Malkin, Jeanette R.; Rokem, Freddie (eds.). Jews and the making of modern German theatre. Studies in theatre history and culture. University of Iowa Press. p. 304. ISBN 978-1-58729-868-4. Retrieved 2011-10-28. [...] audiences heard on the stage a continuum of hybrid language-levels between Yiddish and German that was sometimes combined with the traditional use of Mauscheldeutsch (surviving forms of Western Yiddish). ^ Applegate, Celia; Potter, Pamela Maxine (2001). Music and German national identity. University of Chicago Press. p. 310. ISBN 978-0-226-02131-7. Retrieved 2011-10-28. [...] in 1787, over 10 percent of the Prague population was Jewish [...] which spoke German and, probably, Mauscheldeutsch, a local Jewish-German dialect distinct from Yiddish (Mauscheldeutsch = Moischele-Deutsch = 'Moses German'). ^ a b "History & Development of Yiddish". www.jewishvirtuallibrary.org. Retrieved 2017-02-07. ^ a b Magocsi, Paul Robert (2010). A History of Ukraine: The Land and Its Peoples. University of Toronto Press. p. 537. ISBN 978-1-4426-4085-6. ^ "Hebrew or Yiddish? - The Interwar Period - The Jerusalem of Lithuania: The Story of the Jewish Community of Vilna". www.yadvashem.org. Retrieved 3 April 2019. ^ Wex, Michael (2005). Born to Kvetch: Yiddish Language and Culture in All Its Moods. St. Martin's Press. p. 29. ISBN 0-312-30741-1. ^ "Talen in Nederland | Erkende talen". Rijksoverheid.nl. 2010-07-02. Retrieved 2013-12-08. ^ Most spoken languages in the United States, Modern Language Association. Retrieved 17 October2006. ^ Emanuelis Zingeris, Yiddish culture Archived 2012-03-30 at the Wayback Machine, Council of Europe Committee on Culture and Education Doc. 7489, 12 February 1996. Retrieved 17 October 2006. ^ Rozovsky, Lorne. "Jewish Language Path to Extinction". Chabad.org. Retrieved 2013-12-08. ^ Zuckermann, Ghil'ad (2009), Hybridity versus Revivability: Multiple Causation, Forms and Patterns. In Journal of Language Contact, Varia 2: 40-67, p. 48. ^ Zuckermann, Ghil'ad (2009), Hybridity versus Revivability: Multiple Causation, Forms and Patterns. In Journal of Language Contact, Varia 2: 40-67, p. 46. ^ Yiddish Studies Thrives at Columbia After More than Fifty Years – Columbia News. ^ "Информационные материалы всероссийской переписи населения 2010 г. Население Российской Федерации по владению языками". Retrieved 2013-12-08. ^ a b "журнал "Лехаим" М. Е. Швыдкой. Расставание с прошлым неизбежно". Lechaim.ru. Retrieved 2013-12-08. ^ "Birobidzhaner Shtern in Yiddish". Gazetaeao.ru. Retrieved 2010-08-07. ^ Rettig, Haviv (2007-04-17). "Yiddish returns to Birobidzhan". The Jerusalem Post. Archived from the original on 2012-07-08. Retrieved 2009-10-18. ^ Статистический бюллетень "Национальный состав и владение языками, гражданство населения Еврейской автономной области" [Statistical Bulletin "National structure and language skills, citizenship population Jewish Autonomous Region"] (RAR, PDF) (in Russian). Russian Federal State Statistics Service. 30 October 2013. In document "5. ВЛАДЕНИЕ ЯЗЫКАМИ НАСЕЛЕНИЕМ ОБЛАСТИ.pdf". ^ Walker, Shaun (27 September 2017). "Revival of a Soviet Zion: Birobidzhan celebrates its Jewish heritage". Retrieved 3 April 2019 – via www.theguardian.com. ^ Yekelchyk, Serhy (2007). Ukraine: Birth of a Modern Nation. OUP USA. ISBN 978-0-19-530546-3. ^ (in Swedish) Regeringens proposition 1998/99:143 Nationella minoriteter i Sverige[permanent dead link], 10 June 1999. Retrieved 17 October 2006. ^ "sprakradet.se". sprakradet.se. Retrieved 2013-12-08. ^ (in Yiddish) אַ נאַציאָנאַלער האַנדלונגס־פּלאַן פאַר די מענטשלעכע רעכט[permanent dead link] A National Action Plan for Human Rights 2006–2009. Retrieved 4 December 2006. ^ (in Yiddish) נאַציאַנאַלע מינאָריטעטן און מינאָריטעט־שפּראַכן National Minorities and Minority Languages. Retrieved 4 December 2006. ^ "IDG: Jiddischdomänen är här". Idg.se. Retrieved 2009-10-18. ^ Robert Moses Shapiro (2003). Why Didn't the Press Shout? : American & International Journalism During the Holocaust. KTAV. p. 18. ^ (in Yiddish) פֿאָרווערטס: The Forward online. ^ "2011 National Film Registry More Than a Box of Chocolates". Library of Congress, Washington, D.C. 20540 USA. Retrieved 3 April 2019. ^ Volokh, Eugene; Kozinski, Alex (1993). "Lawsuit, Shmawsuit". Yale Law Journal. The Yale Law Journal Company, Inc. 103 (2): 463–467. doi:10.2307/797101. JSTOR 797101. ^ Note: an updated version of the article appears on Professor Volokh's UCLA web page, "Judge Alex Kozinski & Eugene Volokh, "Lawsuit, Shmawsuit" <*>". Law.ucla.edu. Retrieved 2009-10-18. ^ Language by State: Yiddish Archived 2015-09-19 at the Wayback Machine, MLA Language Map Data Center, based on U.S. Census data. Retrieved 25 December 2006. ^ "Detailed Tables – American FactFinder". Factfinder.census.gov. Archived from the original on 2008-12-28. Retrieved 2009-10-18. ^ "Camille Ryan: Language Use in the United States: 2011, Issued August 2013" (PDF). Archived from the original (PDF) on 2016-02-05. Retrieved 2015-01-21. ^ Shamash, Jack (March 6, 2004). "Yiddish once again speaks for itself". ^ CHRISTOPHER DEWOLF, "A peek inside Yiddish Montreal", Spacing Montreal, February 23, 2008. ^ MLA Data Center Results: Kiryas Joel, New York Archived 2015-10-16 at the Wayback Machine, Modern Language Association. Retrieved 17 October 2006. ^ "Yiddish making a comeback, as theater group shows | j. the Jewish news weekly of Northern California". Jewishsf.com. 1998-09-18. Retrieved 2009-10-18. ^ "Poland's Jews alive and kicking". CNN.com. 2008-10-06. Retrieved 2009-10-18. ^ "Galicia Jewish Museum". Galicia Jewish Museum. Retrieved 2011-12-22. ^ Neosymmetria (www.neosymmetria.com) (2009-10-01). "Vilnius Yiddish Institute". Judaicvilnius.com. Retrieved 2009-10-18. ^ Rourke, Mary (2000-05-22). "A Lasting Language – Los Angeles Times". Articles.latimes.com. Retrieved 2009-10-18. ^ "In Academia, Yiddish Is Seen, But Not Heard –". Forward.com. 2006-03-24. Retrieved 2009-10-18. ^ "Naftali Ejdelman and Yisroel Bass: Yiddish Farmers". Yiddishbookcenter.org. 2013-01-10. Retrieved 2013-01-18. ^ Lowensohn, Josh (2009-08-31). "Oy! Google Translate now speaks Yiddish". News.cnet.com. Retrieved 2011-12-22. ^ "Google Translate from Yiddish to English". Translate.google.com. Retrieved 2011-12-22. ^ "Yiddish Book Center's Spielberg Digital Yiddish Library". Internet Archives. Retrieved 10 January 2014. ^ "Yiddish Forverts Seeks New Audience Online". Forward. January 25, 2013. Retrieved 10 January 2014. ^ Finkel, Raphael. "Yiddish Dictionary Lookup". cs.uky.edu. Retrieved 3 June 2016. ^ Finkel, Raphael. "spellcheck". cs.uky.edu. Retrieved 3 June 2016. ^ Wexler, Paul (2002). Two-tiered Relexification in Yiddish: Jews, Sorbs, Khazars, and the Kiev-Polessian Dialect. De Gruyter Mouton. ISBN 9783110898736. ^ OHCHR. "OHCHR English". www.ohchr.org. Retrieved 3 April 2019. ^ a b OHCHR. "OHCHR Yiddish". www.ohchr.org. Retrieved 3 April 2019. ^ OHCHR. "OHCHR German". www.ohchr.org. Retrieved 3 April 2019. Baumgarten, Jean (2005). Frakes, Jerold C. (ed.). Introduction to Old Yiddish Literature. Oxford: Oxford University Press. ISBN 0-19-927633-1. Dunphy, Graeme (2007). "The New Jewish Vernacular". In Reinhart, Max (ed.). Camden House History of German Literature, Volume 4: Early Modern German Literature 1350–1700. pp. 74–79. ISBN 1-57113-247-3. Fishman, David E. (2005). The Rise of Modern Yiddish Culture. Pittsburgh: University of Pittsburgh Press. ISBN 0-8229-4272-0. Fishman, Joshua A., ed. (1981). Never Say Die: A Thousand Years of Yiddish in Jewish Life and Letters (in Yiddish and English). The Hague: Mouton Publishers. ISBN 90-279-7978-2. Frakes, Jerold C (2004). Early Yiddish Texts 1100–1750. Oxford: Oxford University Press. ISBN 0-19-926614-X. Herzog, Marvin; et al., eds. (1992–2000). The Language and Culture Atlas of Ashkenazic Jewry. Tübingen: Max-Niemeyer-Verlag in collaboration with YIVO. ISBN 3-484-73013-7. Katz, Hirshe-Dovid (1992). Code of Yiddish spelling ratified in 1992 by the programmes in Yiddish language and literature at Bar Ilan University, Oxford University, Tel Aviv University, Vilnius University. Oxford: Oksforder Yiddish Press in cooperation with the Oxford Centre for Postgraduate Hebrew Studies. ISBN 1-897744-01-3. Katz, Dovid (1987). Grammar of the Yiddish Language. London: Duckworth. ISBN 0-7156-2162-9. Katz, Dovid (2007). Words on Fire: The Unfinished Story of Yiddish (2nd ed.). New York: Basic Books. ISBN 0-465-03730-5. Kriwaczek, Paul (2005). Yiddish Civilization: The Rise and Fall of a Forgotten Nation. London: Weidenfeld & Nicolson. ISBN 0-297-82941-6. Lansky, Aaron (2004). Outwitting History: How a Young Man Rescued a Million Books and Saved a Vanishing Civilisation. Chapel Hill: Algonquin Books. ISBN 1-56512-429-4. Liptzin, Sol (1972). A History of Yiddish Literature. Middle Village, New York: Jonathan David Publishers. ISBN 0-8246-0124-6. Margolis, Rebecca (2011). Basic Yiddish: A Grammar and Workbook. Routledge. ISBN 978-0-415-55522-7. Rosten, Leo (2000). Joys of Yiddish. Pocket. ISBN 0-7434-0651-6. Shandler, Jeffrey (2006). Adventures in Yiddishland: Postvernacular Language and Culture. Berkeley: University of California Press. ISBN 0-520-24416-8. Shmeruk, Chone (1988). Prokim fun der Yidisher Literatur-Geshikhte [Chapters of Yiddish Literary History] (in Yiddish). Tel Aviv: Peretz. Shternshis, Anna (2006). Soviet and Kosher: Jewish Popular Culture in the Soviet Union, 1923-1939. Bloomington, IN: Indiana University Press. Stutchkoff, Nahum (1950). Oytser fun der Yidisher Shprakh [Thesaurus of the Yiddish language] (in Yiddish). New York. Weinreich, Uriel (1999). College Yiddish: An Introduction to the Yiddish language and to Jewish Life and Culture (in Yiddish and English) (6th rev. ed.). New York: YIVO Institute for Jewish Research. ISBN 0-914512-26-9. Weinstein, Miriam (2001). Yiddish: A Nation of Words. New York: Ballantine Books. ISBN 0-345-44730-1. Wex, Michael (2005). Born to Kvetch: Yiddish Language and Culture in All Its Moods. New York: St. Martin's Press. ISBN 0-312-30741-1. Witriol, Joseph (1974). Mumme Loohshen: An Anatomy of Yiddish. London. For a list of words relating to Yiddish, see the Yiddish category of words in Wiktionary, the free dictionary. Wikimedia Commons has media related to Yiddish language. Wikivoyage has a travel guide for Yiddish phrasebook. Wikisource has the text of the 1920 Encyclopedia Americana article Yiddish Language. Comparison of Eastern and Western Yiddish based on stable vocabulary. EVOLAEMP Project, University of Tubingen.